YOU HAVE AN 8 PAGE ARMORY POST. PICK A GUN YOU SICK MAN. Aw snap... how much fitment work did you have to do? I was trying to come up with a gun design that I could use on days when I wanted to move around a lot, rather than sit in silence and wait for that perfect headshot. However, if you've ever played with a DMR, you understand how it can be very hard to go back to a lesser weapon... Nothing more frustrating than playing and cussing yourself saying "If I only had my PSG-1 right now..." Once I stumbled upon the M14 JAE, I knew it was perfect for what I was looking for. 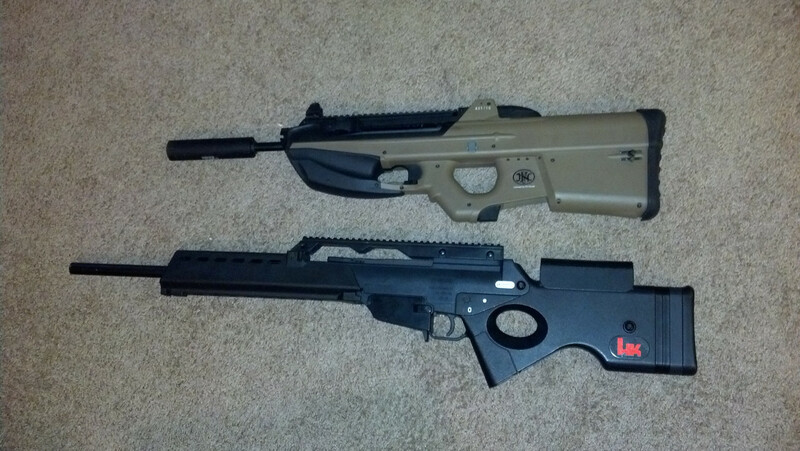 Obviously very modern and tactical, and more mobile than my other guns. 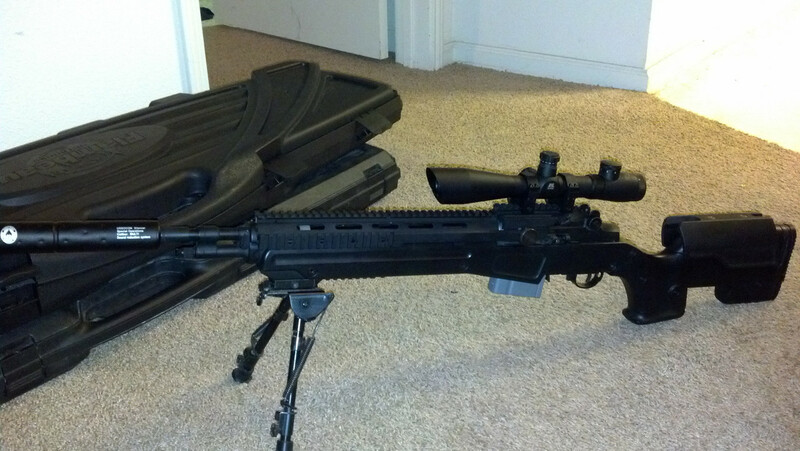 At 3' 9", it is actually about 7 inches shorter than my other two DMRs. I knew the internal focus would be to pull at least a M150, but also give me great trigger response, so that I could run-n-gun on the field a bit more. Anyway, on to the pictures. The V7 gearbox just looks so simple and easy, doesn't it? Note- I found my ball bearing spring guide after this picture. Also, that spring in the picture is a SP180, which I regret to say, was not used in the final build. All of these trigger mech pieces are why the V7 is not simple. And the fire selector side. 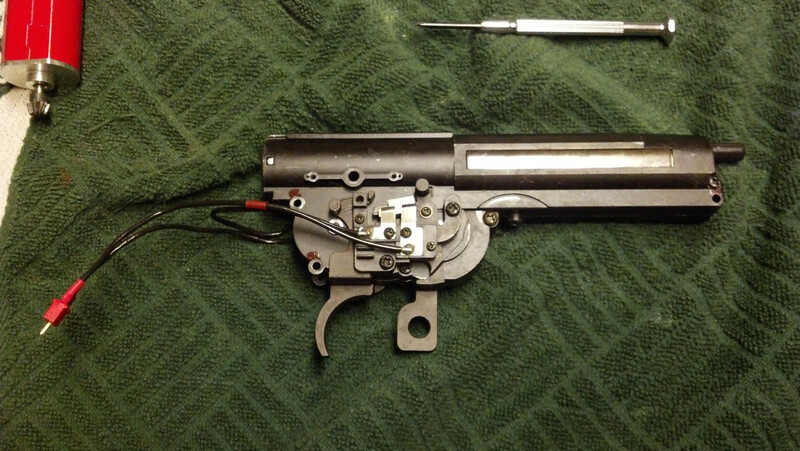 I cheated a good bit and took out the linkage for the fire selector itself. It is just decorative in the end. I am limiting my firing other ways. Here is the motor mounted to the GB. Notice the electrical tape... The motor was shorting out against the motor cage. That took a while to diagnose. 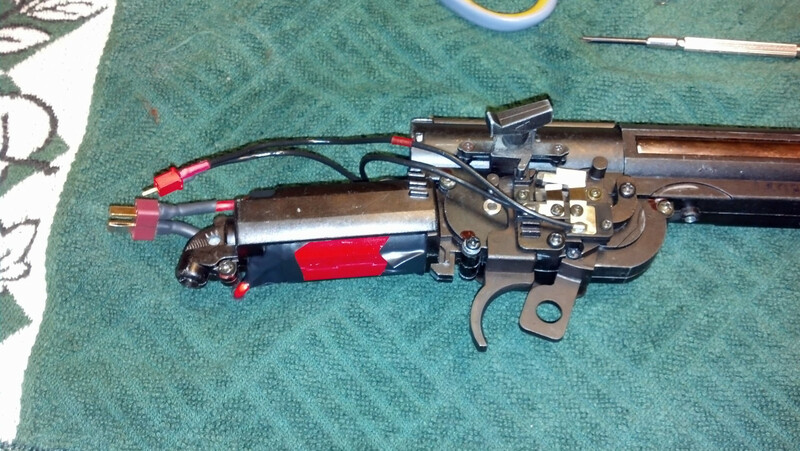 I'm also using a 4 wire mosfet with the gun, to that's why the wiring is done that way. 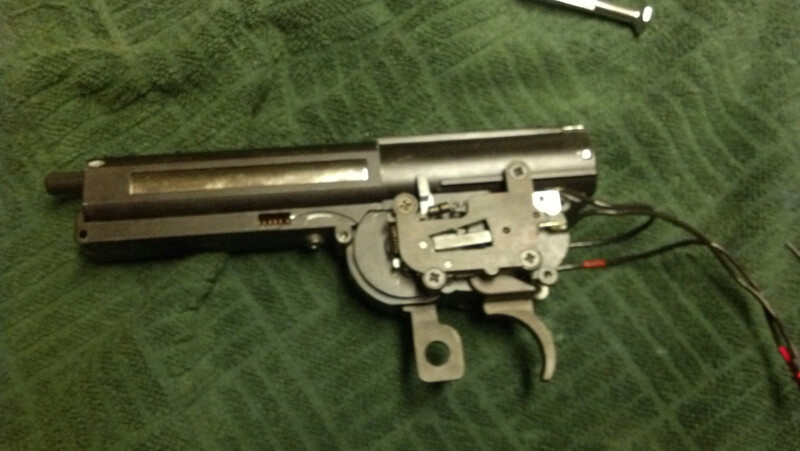 Here are the 4 wires going through the grip to the stock. There is not enough of a pass through for a deans connector, so I soldered the wires in place, which is why I need connectors in this area.... To get the gearbox out of the body. 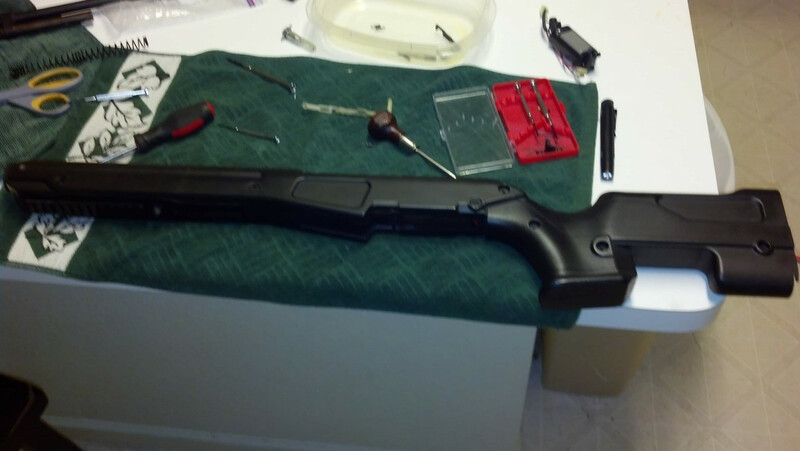 Here is the view looking into the stock. Cheetah 2n Mosfet is in the lower section, which has been programmed to semi-only mode. 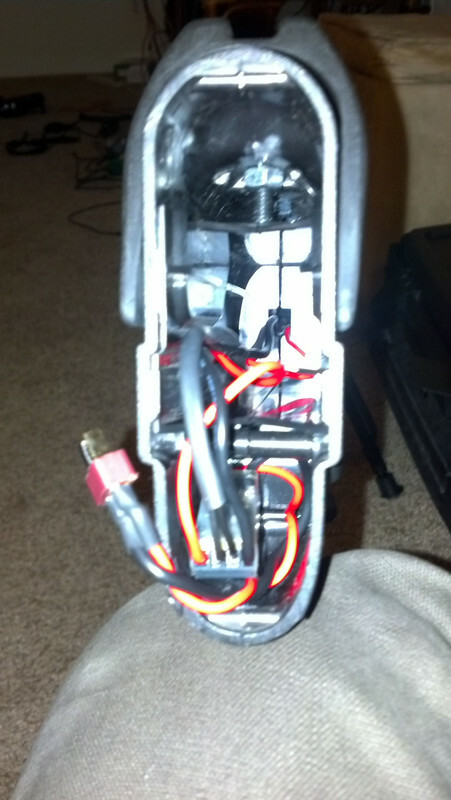 The center section is HUGE, waiting for a nice sized 14.8v lipo. If you look at the top you can see the bolts for the cheekrest. 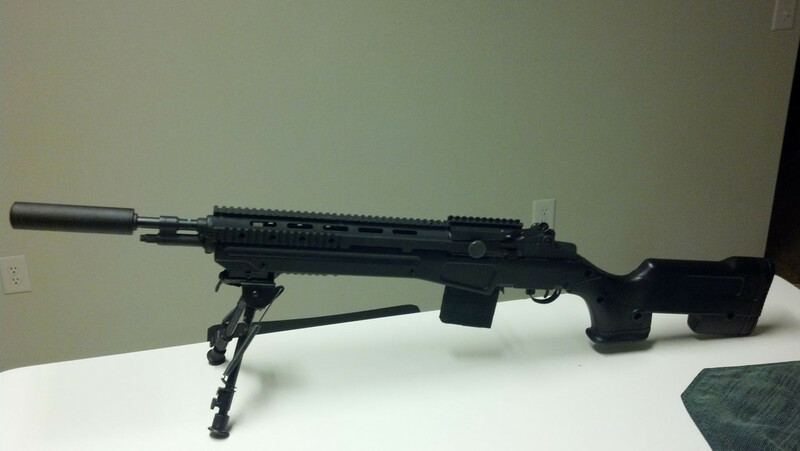 The cheekrest, BTW, was ordered from the actual J. Allen Enterprises, INC. There was no way I was going to find a Kart one anywhere. 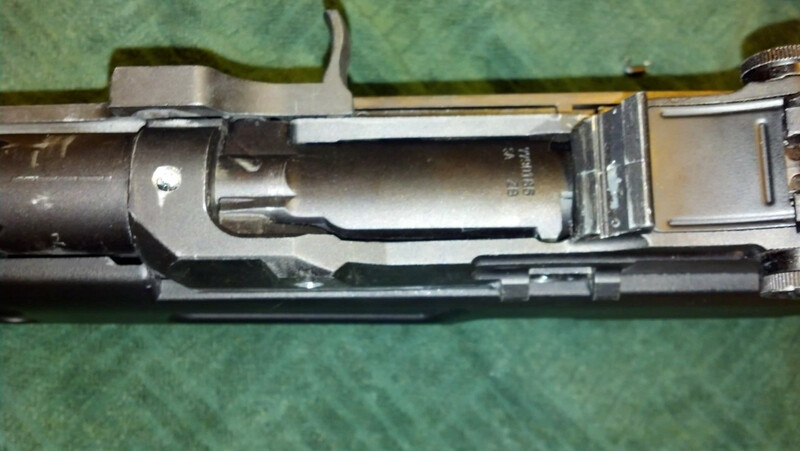 Note the hole drilled just in front of the breech. 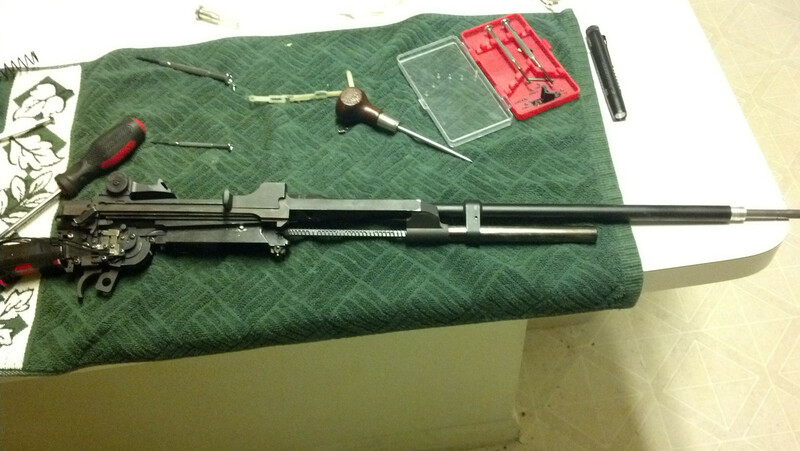 Since I have both a RIS system, and a scope mount, they could not share the screw mount of the left side of the gun. 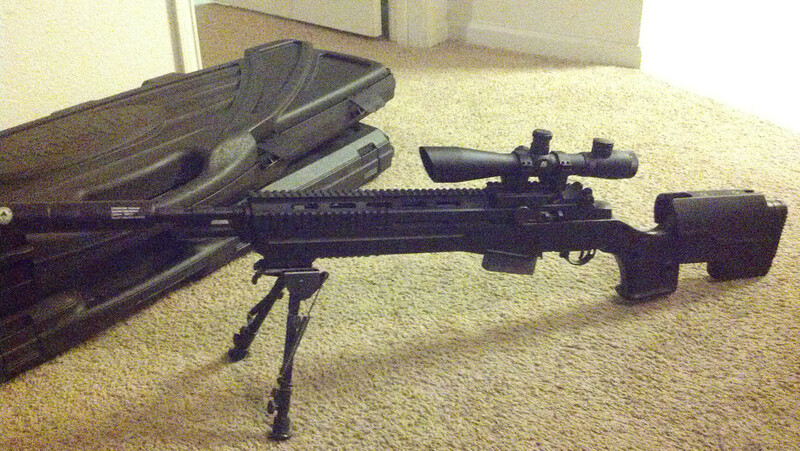 So I drilled and tapped a hole there for the scope mount to run a set screw into. 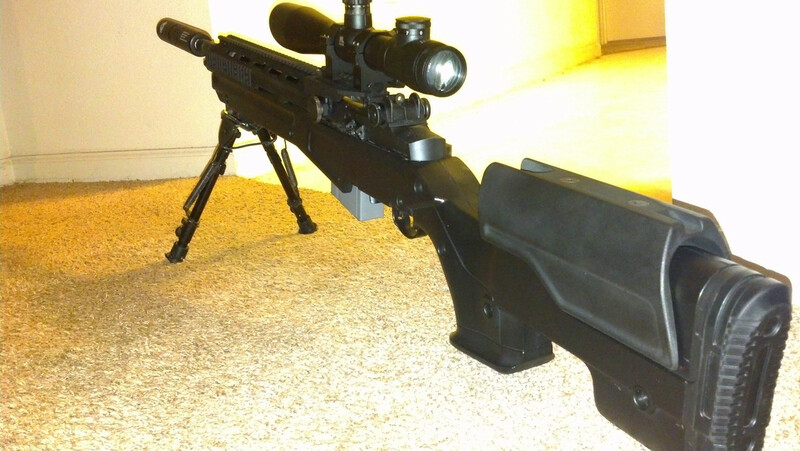 You'll notice the scope mount piece is (lazily) cut on the left side so it will clear the RIS system. Found a Kart JAE gun/body. This was the hardest part. Kart is the only company that makes the JAE body for Airsoft, and they're so low end that nobody bothers to put them up for sale. Some type of upgraded piston head I had around. 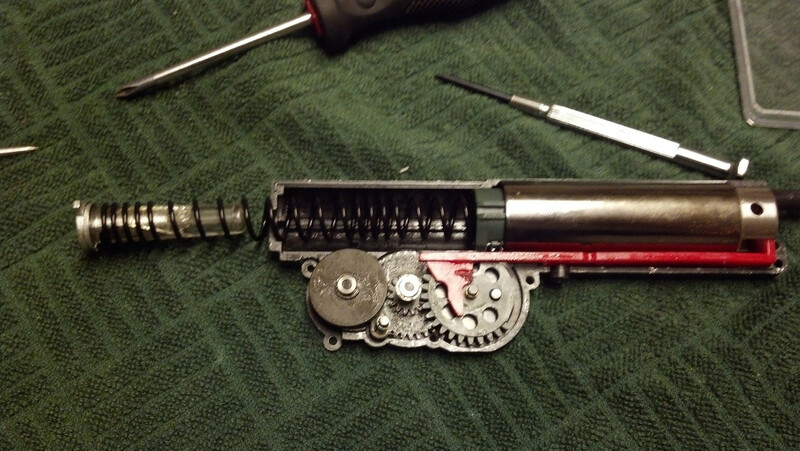 As I said, the SP180 spring was just too much for the gun. I'm not even sure what spring it has in it, but it slings .40s out pretty quick (M150 or M160 I bet). Crono readings coming soon. Running on a 11.1v 20c Lipo right now, but will be bumping up to a 14.8v shortly. "We are chairsofting, but in a MilSim sort of way". Are you doing the SD CASV on the fn2k like you wanted to do on Kory's?